Cubs using an outdated logo. This was something I had wondered for a while and I had suspected it, but never got a clear look until today. 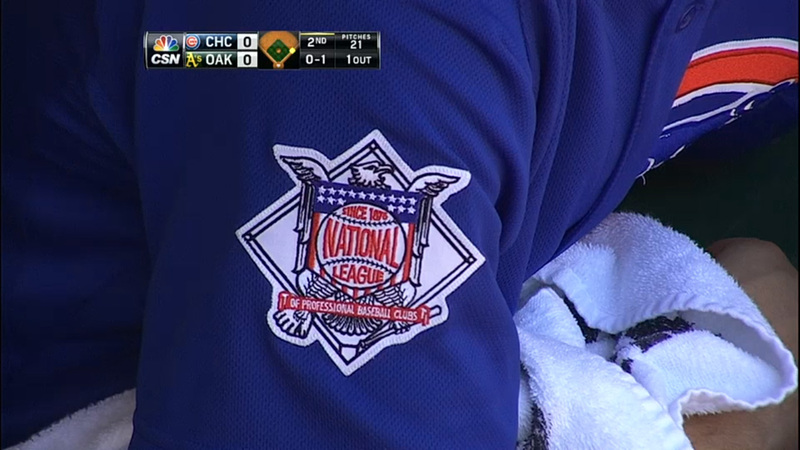 The Chicago Cubs are the only team that features the National League logo as a patch on their jersey. But with the National League reducing to 15 teams this year, the logo needed an update. The logo features 16 stars, one for each team in the league. However, because of the realignment, it should be 15 stars. The Cubs, however, have continued to use the outdated logo all season long. Today while watching the A’s-Cubs game, I finally got a chance to see closeup of it. The Cubs are behind the times. This entry was posted in Chicago Cubs, Logos, MLB, Uniforms & Design and tagged National League, Patches. Bookmark the permalink.